by the lovely + smart Aimee Dolich : buy yours here. How's that for starters? Care to join me? You don't have to lose your current job to begin the one you love! And, if you've already made the switch from the life you liked to a life you adore, please share. If this is your dream, share that too. Let's stay inspired together! I love inspirational quotes Suzanne. If only life didn't keep getting in the way - I might act on some of them. Love the post! Especially the quote "stay inspired!" I made the switch after my job was outsourced 2.5 years ago. I now have a life I adore, but what I'm learning as there are still those days, I still have the same insecurities, I still have stress, just not the "I'm going to throttle the boss" kind and whereas I can't say I love it everyday, I can say I love it more than anything I've ever done! 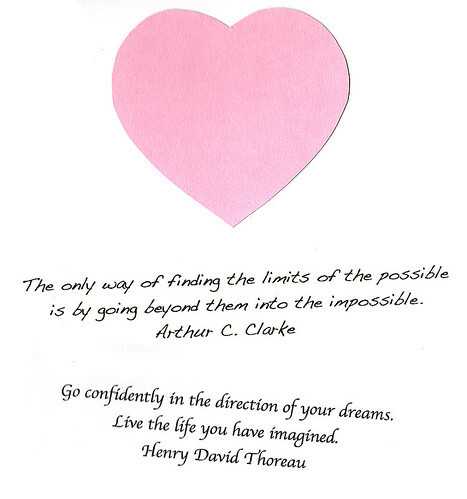 And yes, you have to stay inspired because it's up us as the individual to make the dream come true. Daily. It is amazing to see all of my former lives come to play at this moment in time of my life, in some way, sometimes big, sometimes small, informing what I'm doing. All those experiences (even the crappy ones) are paying off! General direction vs. detailed plans are good - especially when you're trail blazing - it makes it so much easier to make minute by minute changes! I am a professor too and in the same position. (and hoping the change -when a new job actually comes---goes smoothly). Oh Suzanne! I've been so disconnected from blogland that I somehow missed some news? Are you no longer teaching? If that's the case, then it is a HUGE loss for all of the students that will not have the opportunity to experience your amazing teaching style & talent! Email me if you want to chat or brainstorm... I may even have a few ideas to send your way. Big hugs! Trust the somewhat trite adage that when one door closes, another (better!) door always opens! It really is true! Hi Suzanne! You have received an award on my blog! a few years ago, i made the switch and then i lost it. i'm going to recapture it and take the first step on wednesday. you can hold me to it. i would recommend this movie - http://www.sonyclassics.com/thesecretintheireyes/. we just saw it yesterday and i'm still inspired by the message. you'll get there because why shouldn't you? As one of Suzanne's students this year, I can tell you that the department will greatly miss her!! I know my classes with her have inspired some fun artwork I wasn't aware I could do and others that I found challenging and painful to get through, but the end result gave me a great sense of accomplishment. Suzanne, your love for your work shines through with each class and I'm so sad you're leaving. I do know that whatever you do, you will continue to inspire others to do what they love. i worked in consulting for years and their program looks really interesting & engaging. Hmmn. Yes, I care to join you. I left my (very good) writing job almost two a year and a half ago to go to art school and study illustration. It's a privilege, it's exhilarating, it's fun, it's hard and ... occasionally, it's a humbling, heart-crushed-against-the-rocks kind of experience. I never, ever regret doing it; and yet sometimes I wonder at the difference between what I thought it was going to be like, and what it is. Anyway, like you, I'm now way more responsible for keeping myself inspired so that the new life I adore doesn't just become a life I kinda like. 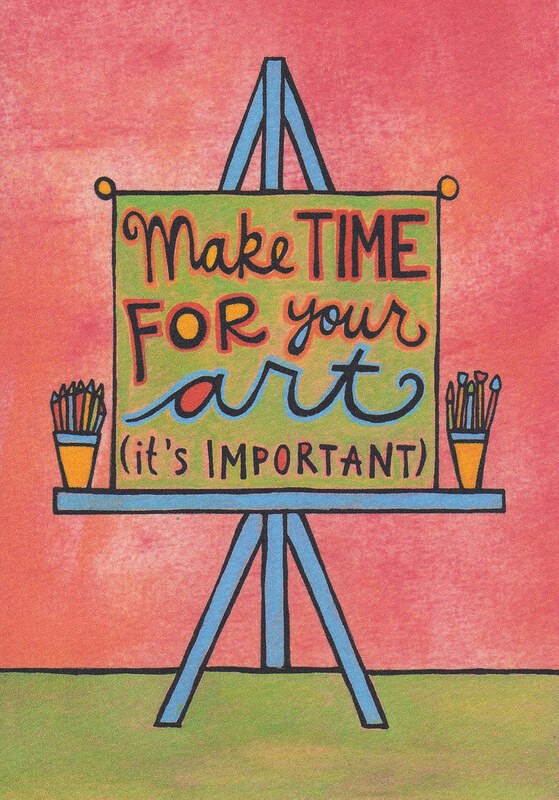 "make time for your art" - loving that one! I soooo need to start drawing again. Maybe this evening.... Thanks for all these inspiring quotes! Thank you for sharing this! I Will join you too, sooner or later. 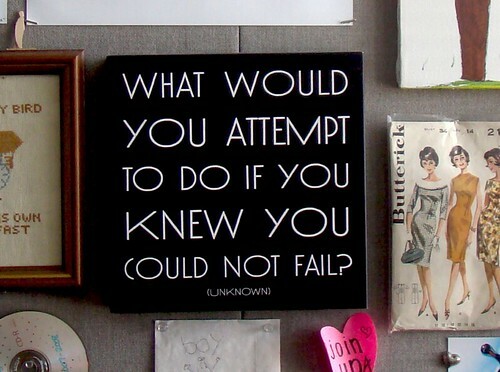 I am trying to figure out right now what to do with My life and I Love your inspirationsl Wall. I think I need to make an inspirational Wall as My first NeXT step. your post is so inspiring. You spoke about blogs in one of my sister's classes this semester and she was greatly inspired and in turn inspired me. I imagine you will be greatly missed there, but I'm excited for your future. Whatever you do, I hope you keep blogging about it! Yeah, I'm drowning under the responsibilities of my life and cannot focus on either what I should be doing or want to be doing, so my wheels just spin. I'd love to be inspired to find some direction and creativity. For all of you who responded so sweetly to this post...I want to say thank you! Your support means SO much!